The first is HARRY KISLEVITZ, himself. He really was a decent painter and very good art director. When one thinks of “Classic Colorforms” in terms of collectibility, they are referring essentially to all those toys produced in the years well before I met Harry. Beginning with the first basic shape set, he either designed or art directed all of them. But more than that, and more importantly, Harry really though that artwork mattered. And therefore, unlike anyone else I ever encountered in the toy industry, he would simply hire the best talent money could buy and pay the price unflinchingly. 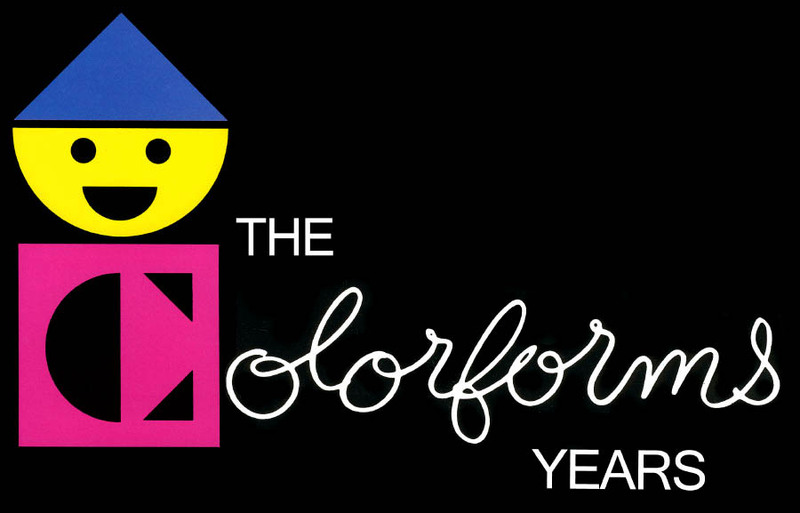 Beginning with the Colorforms logo, which was designed by none other than the great Paul Rand, Colorforms paid more for art than anybody. After all, Colorforms stick-on toys were unique in that the artwork was not merely packaging, added on, after the fact. The artwork, itself, was the toy. And Harry looked over every aspect of its design carefully. No detail was too small to escape his discerning eye. Every nuance mattered. “Maybe we should move this type a quarter of an inch” he’d say. Some might see this final finessing as finicky. But in my eyes he was always unerringly right. This made working with him a joy, knowing one’s efforts were indeed appreciated. Harry was a true connoisseur to whom good art and good design was more important than the bottom line. Later on, when I was “art directing”, Harry’s propensity for hiring "the best" made my task easy. I never had to be unpleasant; I just stepped aside and let great artists do their thing. But right from the beginning, even when I first met Harry, the Best of the Best was already in place. I am speaking of the second Artist I want to introduce you to: BILL BASSO. I should really say Bill Basso Senior, for now his son William Basso Jr. has become a well known and accomplished artist too. Bill always considered himself an illustrator, but there was nothing he couldn’t do. Everything I ever knew about paste-ups, type and mechanicals, I learned by watching Bill. He was a true professional, who shared a studio in Manhattan to which he traveled every day. Bill had a unique style, ranging from sweet to bittersweet, and a deliciously bizarre and subtle sense of humor, that permeated every line he drew. Was he ideal for doing licensed characters? I’d have to say both Yes and No. Sometimes “No”, because his own style and identity always shone through. He really was too good for such subservient endeavors. Everything he did was recognizably “his”. Try as he might, he could not wholly subjugate his unique look to one dictated by others. But, most of the time, the answer was “Yes”, and then some! For Bill at his best was always better than the original character. When the fit was right, he elevated the subject matter to heights that it had never reached before. His re-creation of Raggedy Ann brought a dying property to life again. And later, Bill’s “Holly Hobby” was more appealing than anything Holly, herself, had done. His 1976 "Castle Dracula" Colorforms was a tour de force of exquisite esoteric humor. One thing about Bill always intrigued me. In all my years as an art student, including two at Pratt, where I majored in illustration, I never met an illustration student, who wanted to be an illustrator. Like me, they all wanted to be painters. Bill was the only one I ever met, who actually wanted to be an illustrator. That’s what he was, and that’s what he always wanted to be. He was happy. When I first entered Harry’s world, Bill was already there before me, doing many of the best Colorforms. 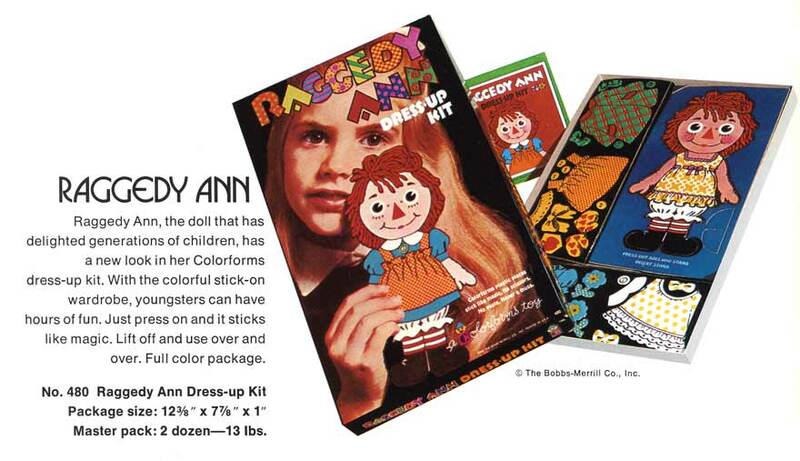 His Classic Raggedy Ann dress up set was in the line already, and remained there for all the years that I was around. Raggedy Ann was one of many dormant characters that Harry dragged out of obscurity to, once again, gain popularity. He even tried to resurrect Shirley Temple. 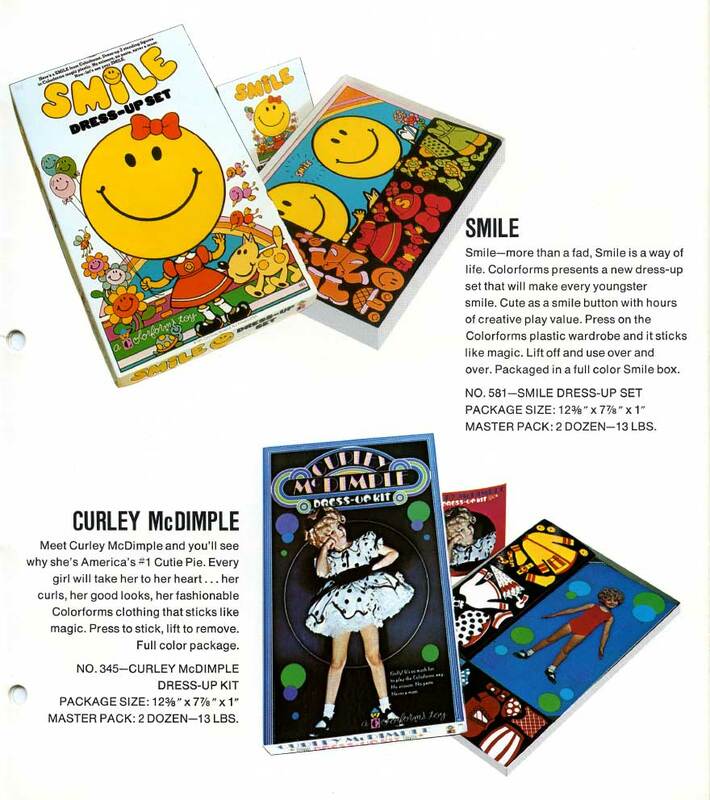 When Shirley Temple Black refused to grant a license, Harry made a Colorforms toy of “Curley Mc Dimple”, an Off-Broadway parody, instead. Of course, it failed dismally. Naturally, like many others, Bill Basso did this toy too. At the top of the same page in the 1972 catalogue is the “Smile Dress-Up Set”, another one of Harry’s, I thought, bright, ideas that Bill successfully brought to life, as well. Meanwhile, throughout my early years with Harry, whenever I had to produce a package, one that required type, hand lettering or mechanicals, Harry hired Bill to save me. Although I supplied the photos and Bob Engle did the product paintings, it was Bill who created the packages for the Outer Space Men. He also did the plastic pieces for most of my early attempts at Colorforms Stick-Ons. 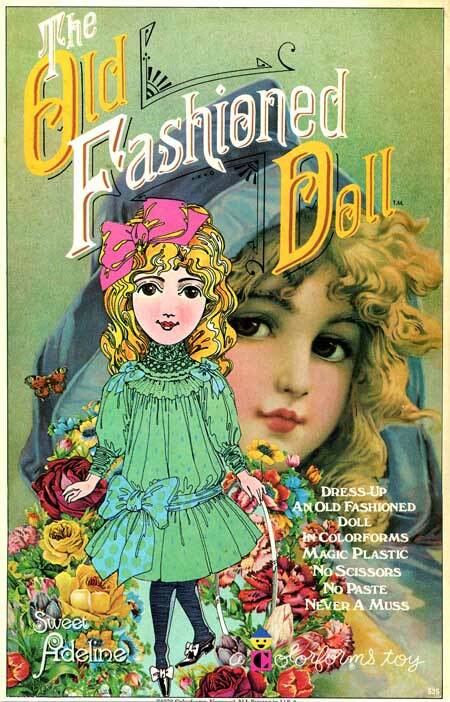 All the while I was associated with Colorforms, Bill was always busy, creating toys for Colorforms, one after another. He was never without a new one due. The third artist I am about to introduce you to was, in many ways, to me, the most important. MIKE STROUTH is his name. 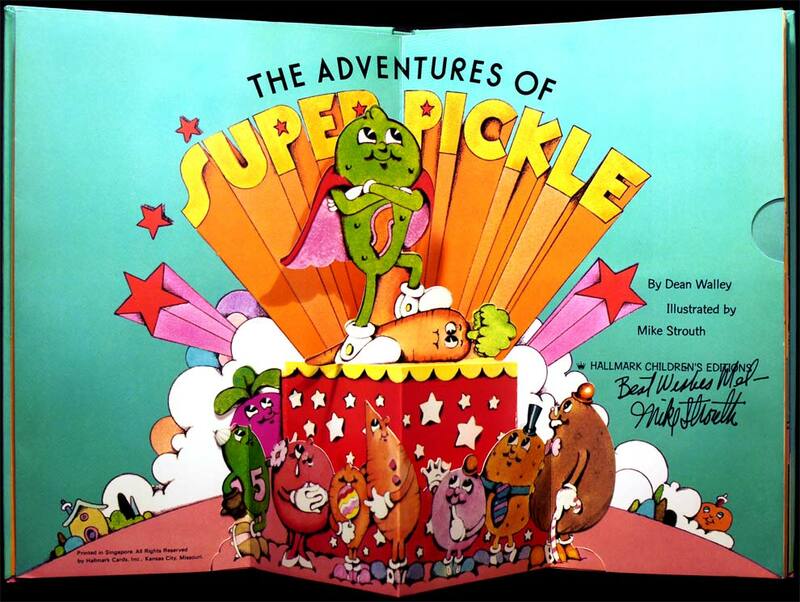 One day early in 1973, I was in a Hallmark card shop when a curious little pop-up book called “The Adventures of Super Pickle” caught my eye. Meanwhile, at that very moment, clear across the country in Kansas City, Mike Strouth and his lovely loving wife Rosie, along with their 4 perfect children were living the Utopian life at Hallmark. When I picked up that book that day and carried it to the check out counter, their Destiny his was in my hands! As I became more and more involved with Colorforms, one fact had become crystal clear. I could whip out a concept in just a day or two, but finished art took me forever. This drove Harry crazy. After seeing me out of commission for the better part of two years, doing the Outer Space Men, then watching it take weeks on end to do the art on Mickey Mouse toys, he didn’t want to lose me. I was much more productive and amusing to him thinking up new ideas. So he urged me to keep my eyes open for someone who could help me. Ha! Fat Chance that I would discover a talented assistant up here in Dutchess County. 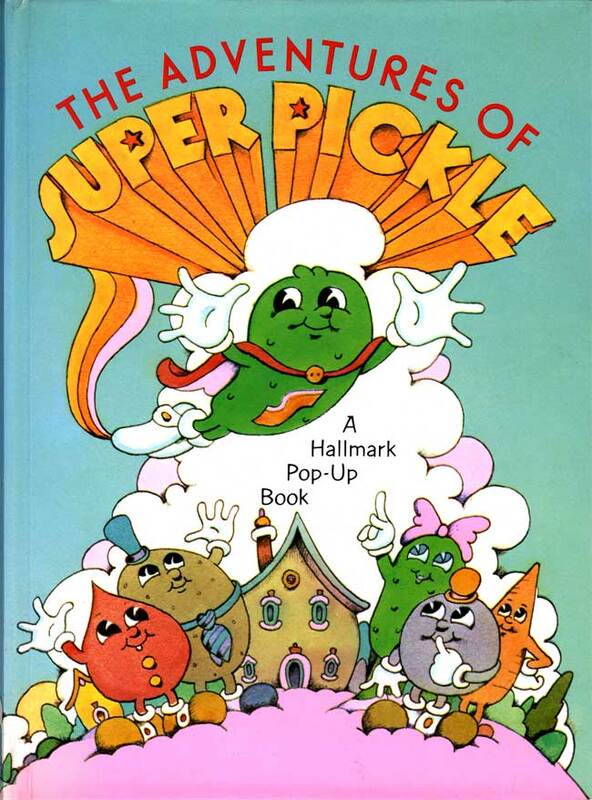 Then suddenly, here was this book called Super Pickle, and unlike the usual Hallmark product, it actually disclosed the artist’s name. “Illustrated by Mike Strouth” it read. From beyond the barrier of time and space, across the many miles, Mikes drawings spoke to me and changed his life forever. I rushed home and excitedly called Harry. Minutes later, he, who never hesitated to pick up a phone and call anybody from Paul Rand to Picasso, was calling Kansas city. Without ever seeing Super Pickle himself, he hired Mike to work on a new project with me. 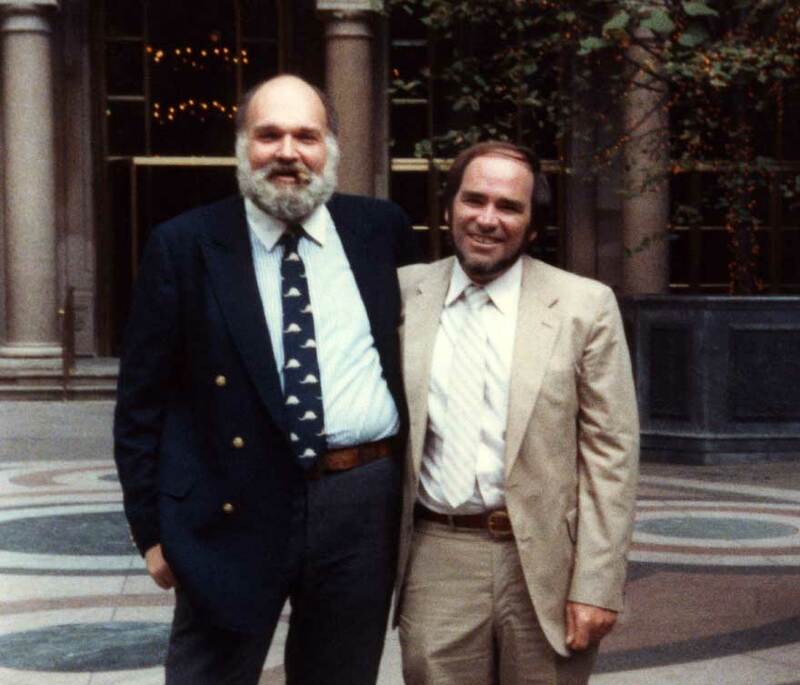 Mike and I proved so compatible and worked so well together from afar that, overnight, the Harry hand of Fate reached out and plucked Mike right out of Kansas City and moved him here to work with me. First Mike alone arrived and stayed a week, house hunting. Harry had hoped he’d find a place near Colorforms in picturesque New Jersey. But when faced with the reality of how expensive that would be, he bought a home up here, not far from me. His family quickly followed to begin a whole new life in Dutchess County. What a change that had to be. Both Mike and Rosie, she was an artist too, had been snatched right out of art school by talent scouts from Hallmark, and whisked off to Hallmark-land in Kansas City. There they lived the Hallmark life. All their friends were artists, with whom they had a lot in common, living together in an ideal community where everything they needed was supplied. Every day they “had a good day”, and every Hallmark-created Holiday was, not only, celebrated but believed in. I have often wondered how they could bear to tear themselves away to live in Upstate New York, cold and artless, where few cared enough to give a damn, let alone, “the very best”. And so it came to be that Mike and I began a kind of friendship/partnership, working together harmoniously for the next 13 years. My eagle eye had proved unerring; what Supper Pickle said to me proved true: this was, indeed, a match made in heaven. Mike had a talent that never ceased to amaze me. Everything he touched turned out delicious. And, more often than not, what he touched was a comp first done by me. Then he transformed it into Finished Art with incredible speed. He never failed to vastly improve on what I gave him, retaining all the good parts correcting most of the bad. Of course, he was more than capable of working without me, and executed many a project, from start to finish, on his own. But most often we worked together, with me comping up the contents while Mike designed the cover. The end result would fit together as if one artist had done it all, one artist a bit more clever than each of us alone would be. One thing about Mike that never ceased to amaze me, was the fact that he was so "ordinary". I mean that in the nicest way. Having traveled from U of M to Pratt, to Paris, and back to NYC again, I had encountered every shape and form of artist. All of them managed to look and act like artists, irregardless of whether or not they did or didn’t do any artwork, let alone, have any talent. And suddenly, along came Mike, an ordinary guy. It was as if, somewhere from a cloud in Heaven, the Muses had tossed to Earth a giant bundle of raw talent, and it landed, by chance, haphazardly, on the most regular of fellas, growing up in the vast middle of the USA. Mike had hands of gold. But when they weren’t turning out art work ,and touching it with Magic, they were coaching Little League, playing poker with the boys once a week, eating the soup and sandwich Rosie made him for lunch every day, or petting the puppy, a cocker spaniel named Pupcake, who was Mikes constant companion as he worked in an unheated basement next to the washer dryer, churning out magic, throughout the days, and late into each night and early morning.